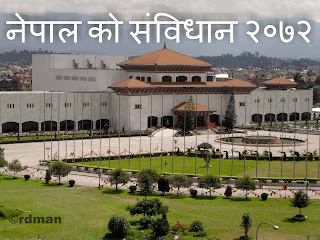 Sep 14, 2015: As the major political parties are determined to formulate the Nepal's new constitution with the current procedure of voting, it seems Nepal will be getting a new constitution within a week. Despite the protest by Madhesh (Southern flat area) based parties and other ethnic parties, three major parties ( Nepali Congress, United Marxist Leninist and former rebel party United Communist party of Nepal) are going firm to pass the Constitution bill from constituent assembly. Prime Minister along with major parties have asked the agitating parties to reconsider their protest and join the dialogue by pausing the ongoing procedure for two days. Previously there were series of invitation from major parties regarding the negotiation and the formal address with the current procedure or even after the promulgation but the Madheshi and Tharu leaders have outright rejected their proposal with the demand of pulling back the security forces including Army and the implementation of formal accord with them. The first day of CA meeting passed three articles of the http://stephaniefulke.blogspot.com /2015/06/draft-of-constitution-of-nepal-ready.html" style="background-color: blue;">proposed constitution draft and as many as 57 articles are passed for the new constitution for the second day. It seems it will require 4 more days to endorse the remaining portion. The draft of the new constitution has 302 articles in 37 parts. Except 64 Lawmakers from Madhesh based parties, majority of the CA members attended the voting process including the fourth party in CA, Rastriye Prajatantra Party Nepal who had even decided to pull out from CA regarding their demand for Hindu nation with Constitutional Kingship. Secular state with freedom of religion. Triangular old national flag with moon and sun. (red colored). Official language: Nepali written in Devnagari Script. National anthem, flower, color, bird to be the same. Cow is the national animal. Citizenship from either father or mother. Daura Surwal and Gunyo Choli is not the national dress. Rights for education, health, employment, food. 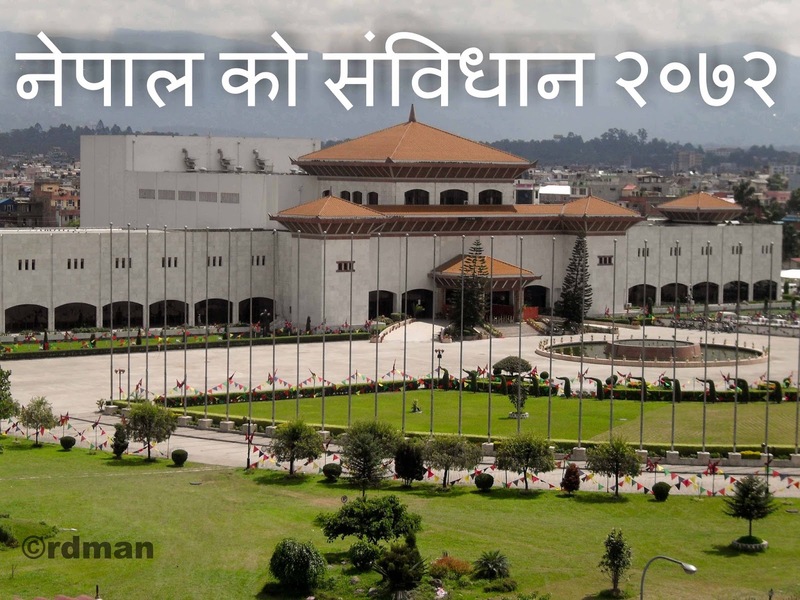 With the current voting process, it is known that the CA will endorse all of the proposed constitution and the promulgation will be done by President in a special ceremony at Constituent assembly on 20 September (Ashoj 3). The promulgation will deliver a new celebration day or public holiday in the history of Nepal as a constitution day on Ashoj 3. Though it seems little awkward to declare constitution with a portion of our own civilian in the street, it is a great moment to deliver the first constitution of Nepal as formulated by peoples representative without any pressure from King or other power house and the number shows that more than 92 percent of peoples representative are involved in the current procedure of voting the constitution. As the constitution is not static, there are still ways to address the demands from the agitating groups and parties even after the promulgation. If their demand is logical and supported by major people, the promulgation of new constitution should not be taken as a defeat of their logical demands as they always have this option to amend the constitution from the two third majority in the coming elections. I even have some reservation in the http://stephaniefulke.blogspot.com /2015/06/draft-of-constitution-of-nepal-ready.html" style="background-color: orange;"> proposed draft of the constitution for which I have written a http://stephaniefulke.blogspot.com /2015/07/my-comment-on-draft-of-new-constitution.html" style="background-color: lime;">blog post and even sent the comment to the CA subcommittee but now I have not taken it as my defeat. I still have the option to vote for the party/ person who will take my voice to represent in the later parliament and amend the constitution for nations and peoples well being. That's democracy and I firmly believe in it. we feel the information Nepal's new consititution to be promulgated on September 20 that's all. hopefully the information Nepal's new consititution to be promulgated on September 20 that we have conveyed can provide benefits for you and all visitors of this blog, if any criticism and suggestions please comment. you just read Nepal's new consititution to be promulgated on September 20 if this article is considered useful and you want to bookmark and share it please use the link https://stephaniefulke.blogspot.com/2015/09/nepal-new-consititution-to-be.html and what if you want other information look for another page in this blog. Every Girl Must Watch This!